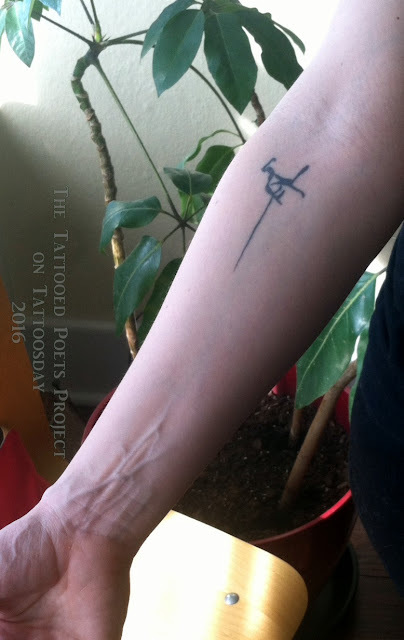 Today's tattooed poet is Elizabeth Hoover. The tattoo she's sharing may not look like much, but I find the story fascinating. "I got my tattoo in 2002 or 2003 (I think). I really love my tattoo, but am self-conscious about the true story behind it. Over the years, I’ve made up some little fibs, but here is the truth: I fell asleep while drawing on a plane coming back from Italy. It was the first time I left the country, which was a big deal for me. When I woke up, I saw this weird little drawing on my forearm. As soon as I got off the plane, I went to Kinko's and Xeroxed my arm. I couldn’t stop thinking about the drawing so about a year later I got it tattooed on my arm at ArtFreek in Providence, RI. The tattoo reminds me about the importance of the accidental in art-making and the power of doing things you thought you’d never do (like travel). Also, I just like the way it looks. Elizabeth shared her poem below, which previously appeared in [PANK]. keeps her strung up in the basement. in a long skirt and cornflower blouse. teach her acquiescence is beautiful. reaching the floor, her blood kicks not that. to an eddy deep enough to swim in. in muscle and tendons grip rocks, branches. memory to tell her: bite or please. 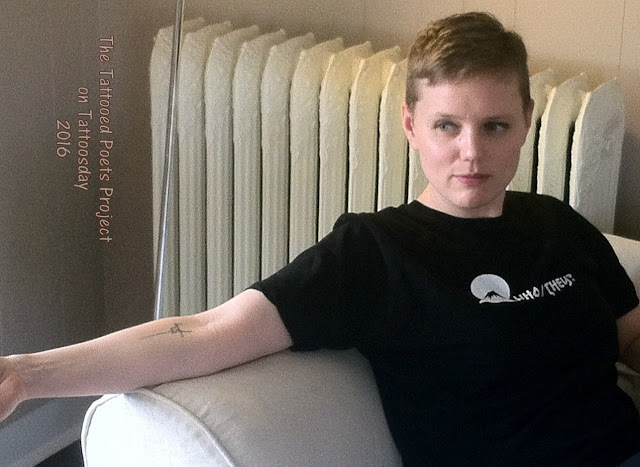 Elizabeth Hoover is a feminist poet who enjoys working on projects with a conceptual or research element. Her current project, Some Poems About Pictures is a hybrid text that offers art as a space for resistance to and transformation of dominant gender narratives. A portion of that project was awarded the 2015 StoryQuarterly essay prize, judged by Maggie Nelson. Her poetry has appeared in [Pank], The Los Angeles Review, and The Pinch, among others. She is a freelance book critic and lives in Pittsburgh with her partner and a cat named Brad. You can see more of her work at ehooverink.com. Thanks to Elizabeth for sharing her cool tattoo and lovely poem with us here on Tattoosday!